Surprise your loved ones in India with an amazing arrangement of roses arranged exclusively. This 30 Red Roses in are arranged in a heart shaped basket. This aromatic arrangement will surely reveal your heart-felt thoughts and emotions to your dear ones. 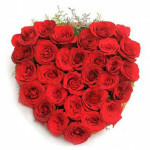 Send this hamper along with other Gifts to India through Chennai Online Florist and make your dear ones feel special. Heart shape arrangement of 30 red roses in a basket with lot of green fillers.